If you could fix your crooked smile without anyone noticing, would you do it? Sure, you would, and you can with clear acrylic aligners from Invisalign. 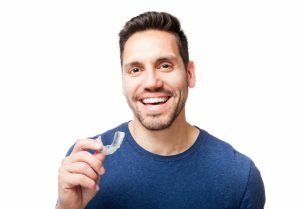 Canton dentist, Dr. J. D. Robison, offers Invisalign as an alternative treatment for teens and adults with mild to moderate orthodontic treatment. Besides their discreet appearance, Invisalign aligners offer other advantages sure to bring out the smile on your face. What Exactly are Invisalign aligners? Invisalign aligners are BPA-free, custom-made pairs of orthodontic appliances which straighten teeth without metal brackets or wires. Smooth, comfortable and very discreet, these aligners move teeth into healthier and better looking positions gradually over an average treatment time of 12 months. Typically, metal braces take 2 years or more. Used the world over by more than 3 million orthodontic patients, Invisalign aligners resemble professional whitening trays. In fact, some patients use their aligners for whitening or as retainers once treatment is complete. Constructed in 18 to 30 pairs, depending on the complexity of the case, the aligners fit tightly over top and bottom teeth. Your dentist in Canton evaluates each prospective Invisalign patient with oral exam, x-rays and computerized 3-D imaging and formulates a specific treatment plan if Invisalign proves appropriate. A special Invisalign lab fabricates the clear braces and sends them to Robison Dental Group. The patient wears the aligners for 20 to 22 hours per day, changing each pair after 2 weeks. As pairs change out, the individual sees visible progress in the positioning of his teeth. After treatment, some individuals wear customized Vivera retainers from Invisalign, keeping their newly straightened smiles perfect permanently. Busy Invisalign patients see Dr. Robison every 4 to 6 weeks for simple progress checks and to receive their next pairs of aligners. For younger patients, Invisalign aligners come equipped with compliance tabs which show if the aligners are being worn for the specified amount of time. Plus, if up to 6 aligners are lost, the dentist replaces them for free. Would You Like to Smile More? You can smile more, and be confident about it, too, when you straighten your smile with Invisalign. Contact Robison Dental Group today for an orthodontic consultation. Dr. Robison has extensive training in orthodontics and can tell you if Invisalign would improve your smile.